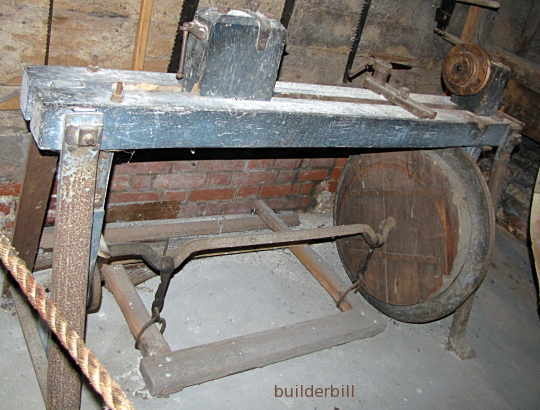 An example of a woodworking lathe driven by a treadle, that is by foot power. This old woodworking lathe is just about as simple as it gets. Made by a carpenter with some help from a blacksmith. It has the basic requirements, a headstock, a move able tail stock and a tool rest. The power is provided by a treadle. A device that was used in hundreds of thousands of sewing machines. The thing that makes a treadle possible on a machine like a lathe is the large flywheel. It would take a fair amount of effort to get that large wheel spinning, but then little to maintain the speed. Have a look at another treadle operated lathe, this one a sophisticated metalworking screw cutting lathe.